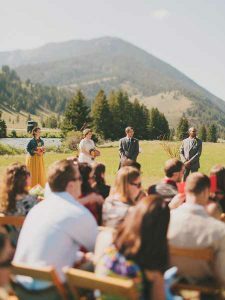 Is Big Sky, Montana The Perfect Place For A Destination Wedding? Yes. When it comes to planning a wedding there are millions of details that you'll need to consider. One of the most important decisions you'll be faced with is where to get married. 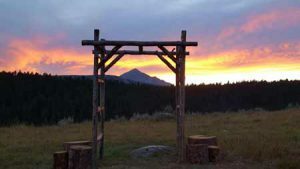 Why don't you plan to get married in Big Sky, Montana? Big Sky is the perfect location for a destination wedding. This charming mountain town has all of the amenities that a bride and groom (and of course their hand picked guests) could ever want and need. What could be more magical than getting married surrounded by snow capped peaks, meadows covered in wildflowers, flowing mountain rivers, and of course your best friends and treasured family? Happy guests combined with a smiling bride and groom makes for the perfect combination. No wedding is complete without focusing on the small details before the big day arrives. Luckily, Big Sky is a popular wedding destination and it's easy to make everything perfect in this small town. You can't go wrong with any of these venues. 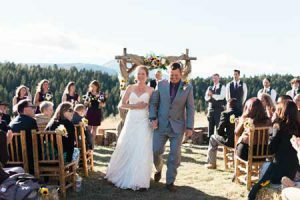 From big and beautiful to small and intimate, anywhere you get married in Big Sky will offer stunning views, professional service, and Montana charm. It's all part of the Big Sky wedding experience. Come to Big Sky and create your very own customized, personalized, and unique ceremonies and receptions. Make this special place, your special place on the happiest day of your life. Start planning your Big Sky wedding at VisitBigSkyMT.com today. Will you say "I Do" in Big Sky? We hope so.